Huge Advancement in Cancer Healing Hemp Oil! As cancer is due to increase 70% by 2030, according to the World Health Org. (source) , advances in medical marijuana, that is curing, not just healing cancer, is ramping up. THC, the pyschoactive ingredient in high concentrate med. herb has been a problem due to the strength of the “buzz”. The Stanley Bros. are developing Hemp Oil that has low THC, fits in with CO state hemp guidelines and is offering to all at very affordable prices. More Information on Hemp Oil and its Origins. Here is a new vaccine information website with critical updates. The Federal Government has proposed mandatory vaccinations on adults and is in the comment period. The proposal says all adults will need to get current on all adult vaccines. Colleges are now requiring all to be vaccinated. By 2016, DHS has said all must have biometric ID’s for interstate airline travel which presumably would include no flying unless vaccinated. Medical Scientists an doctors are coming out saying vaccines are very dangerous and evidence is being suppressed. 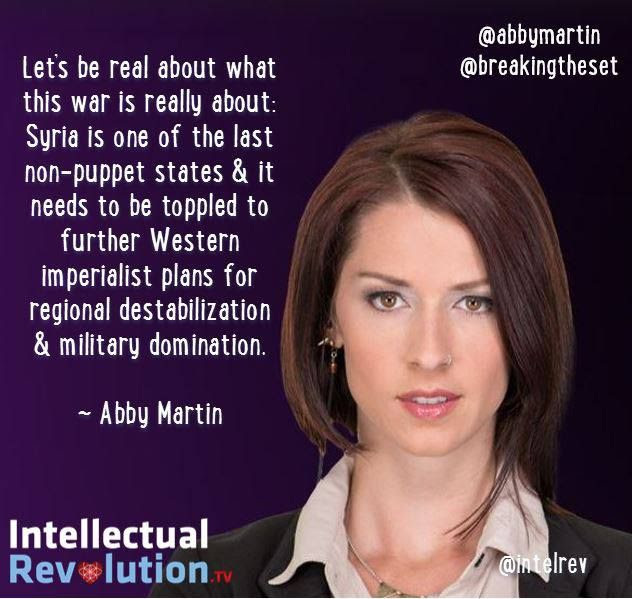 RIP Breaking the Set, Abby Martin You Will Be Missed. There is yet another unrepairable hole in the whole that is our cosmic fabric of a universal Truth Movement. Few seem to understand or realize what a significant, worldwide platform for voices of sanity, truth and justice we all just lost. The end came quick and sudden. A bright, brilliantly lit flame of nightly alternative news source, the biggest and only one we had on nightly TV, has been extinguished. Those aboard the life long quest to find the truth wherever it leads owe a huge debt of gratitude and appreciation to investigative journalist and former news anchor at RT broadcasting (formerly Russia TV), Ms. Abigail Suzanne Martin and her cohorts. It has been two weeks now that she so shocked the Alternative News and Truth Movement with her sudden and abrupt departure. For nearly three years and some 534 shows each weeknight on Breaking the Set, Ms. Martin was able to do something no other TV news broadcaster had been able to do before. And then she called out the liars, the thieves and named names to the ones who have sold our children’s future. She continually claimed she was her own editor and boss of Breaking the Set and held artistic freedom to present whomever, however and whatever she wanted. No other national news broadcaster had ever held such power. She presented to a worldwide audience the raw and unfiltered ugly truths on subjects the puppet masters of mainstream media would never entertain, much less provid air time for….yet Truther’s among us so yearned for. Her segments went under in your head subject headings such as “Think” and “Brainwashed” while she unabashedly bashed the very setting and outlet that gave her show life. Her style was intellectual, passionate, feisty and with a definite edge to them, which paired well with her changing hair and wardrobe choices each night. (Although truth be told, her very first show she wore a Hillaryesque gray pantsuit!). She did not hide behind desks or rely on imagery and canned story lines from corporate owned press releases. She did it her way. Move over Frank. Ms. Martin stayed true to her Media Roots founding and Project Censorship board membership by delivering the most difficult of news stories artistically and without deflection as to the consequences by the powerful authorities she challenged each night. The show was unique and attractively youthful with a decidedly non-defiant “let’s end all the b.s. right here and now” theme all the while staying both passionate and compassionate to the cause of representing and presenting honest journalism. From the very onset she took on all centralized power of corporate, military and government. On her very first show she came out a-swinging for the fences. The shows segments were titled, “USA-made Dictators, NY Times Propaganda and They Hate Us Because We Bomb Then”. In just her first show she took on the world’s largest newspaper, the world’s largest spook agency and the biggest military the world has ever seen. The woman had guts few us could ever dream of having. What maybe was the most impressive about Breaking the Set, night after night, episode after episode, segment after segment, was how she and her staff nailed some of the most important and critical stories of our times with near flawless fact checks and research. The shows format challenged all viewers to connect dots, think critically, and to act for needed change. She continually gave a voice to the voiceless on an international broadcast stage. She gave hip hop and beat artists a stage to perform. She discovered and promoted the seldom acknowledged do-gooder non-profits making a difference where exposure meant more desperately needed funding in many cases. She even had the temerity to reach out to the smallest of communities across the country. When last November our County in Mendocino, CA passed a historic local law that legally elevated community rights over state and federal authority as well as providing legal representation for Nature in our courts, she gave us a voice and air time on her show. It took just one email exchange and we were then booked on her show four days later which we then received attention from around the world. (Source). Welcome to the state of the Universe — which is of course, everchanging, same as always. Here we are once again in the here and now, just like last year at this time. So … are you finally ready to live in the now? Good. We have been waiting for you. What took you so long? With time rapidly becoming a thing of the past (the calendar’s days are numbered, you know) people are living in the now like never before. Listen, I know. I was a futurist in a past life. But now, I have no time for time. I am living all the time in the Timeless Now. I think they call that All-Timers. Meanwhile, here on Earth — or as it is known throughout the galaxies, the Comedy Channel — a critical mass of the heretofore uncritical masses are awakening to a serious truth. There’s something funny going on. America’s two political parties spent $4 billion on the last election and it worked — the American people were soundly defeated. Once again the Golden Rule was overruled by the rule of gold, and the Constitution overrun by the prostitution. The result is government in greedlock and rule by a one-party system where we the people haven’t been invited to the party. We don’t exactly have a name for this new system, although I think Futilism describes it pretty well. Thanks to government for hire, voting has devolved into an act of futility. Whether we vote Democratic or Republican, we seem to end up with Dempublicrats running things. Now some mystics — pessimystics they are called — would look at this shituation and see a glass 95% empty. As an optimystic I take the exact opposite position. I see a glass 5% full. Yes, there is good news. An evolutionary upwising is afoot, and left and right are coming front-and-center around a new common sense consensus. In Colorado and now two other states, this has meant legalizing cannabis. So what does this mean, other than in the Mile High State you can now legally get a mile higher? For one thing it means a blooming economy selling transcendental medication. Science is now finding that humans have THC receptors in the part of the brain called the “hippiecampus”. When this area is stimulated, people see farce fields and laugh at invisible jokes. There’s an old saying — and I know it because I myself made it up many lifetimes ago — the truth shall upset you free. Once again in 2014, inconvenient truths exposed convenient lies. For example, now everyone knows our government is spying on us, and Public Enemy Number One appears to be none other than — the public. Maybe the NSA needs to be balanced out by another three-letter organization, the ICU — Independent Citizens United, where citizens who intensively care about the rule of law can say, “I see you” and begin to oversee what we have until now chosen to overlook. There was another sign of the upwising in 2014. Pope Francis took a stand for social justice, making the Catholic Church more non-dominational. And boy, are those purebred dogma breeders upset! It just goes to show that maybe you CAN teach an old dogma, new tricks. Maybe monotheism is evolving into stereotheism, where the same truth comes from multiple speakers, in many different languages, and some with no language at all. And for those of us who want peace in the Middle East? Let us first try peace in the Middle West. A first step is to quiet our own barking dogmas, and listen to the silence. Instead of just following the herd, follow the unheard … right into your own heart. Imagine, Americans from all tribes coming into the same space of silence, and breathing together. Now that would be a REAL conspiracy, and could expose and help us overgrow the con’s piracy we have now. The evolutionary upwising calls on people everywhere to rise above the identity issues that each side serves up as dogma chow, and instead focus on the identical issues we face now — like being passengers and crew on Spaceship Earth, citizens and denizens of Gaia. So, come on you Gaians! Time to show your species’ pride. And time to evolve from children of God to adults of Good. Yes, I know. We are collectively in this awkward tween phase called addled-essence. Our essence has been addled by obsolete myth-conceptions. So, how do we un-addle our essence? How do we launch this upwising to turn the funk into function, and leave the junk at the junction? I’m glad I asked that question. I have created a three-step program that is mathematically proven to work four times faster than 12-step. If we want to have an upwising, we must wake up … wise up … and show up. We must wake up to the awful truth and the awesome opportunity. Yes the world is in serious condition, largely due to our conditioning to be serious. Seriously. And in this moment of fool-realization, we fully realize our foolishness and laugh in our own face. This is called self-facing laughter, and it helps us illuminate our world from the inside out. People ask me all the time, “How can I uplift humanity?” I take one look at their doomy and gloomy expressions and I say, “You can begin by uplifting the corners of your mouth in a smile.” When you feel the levitational pull giving you a natural face-lift, you are literally overcoming gravity. Hearty laughter brings us from the static of the head to the ecstatic of the heart, and we take the second step to upwising — we wise up loving. It has been said that the more we expand our hearts the less we will need to shrink our heads. Beliefs lie in our head, love lives in our heart. So … are you going to believe those lies? Or live that love? When you sacrifice being happy for being right, you know what they call it? Smartyrdom. With laughter and love helping us wise to the occasion, we take the third step. We show up, living and giving. Each of us has been given a special gift, just for entering. So you are already a winner. We are all here to let our light fully shine — the enlightened ones call this full-filament. It is true that the unexamined life is not worth living, and equally true that the unlived life is not worth examining. To “show up” means to live life fully, and foolly, laughing all the way. Make a bucket list of all the undertakings you wish to undertake before being overtaken by the undertaker. Express your unique love in the world, and make your life a work of heart. Bring your gift to the party, and show up for the greatest show on earth — REALITY! You know, reality. That’s reality TV without the TV. What a movie we’re in! A cast of 7 billion, and all of humanity is in the hero’s role. And the whole world is on the edge of its seat. Will we achieve critical mass before we reach critical massacre? Will there be an awakening, or a wake? I end this 2015 State of the Universe with good news. When it comes to transformation, we have all the time in the world. And that time is now. May we wake up laughing and leave laughter in our wake. © Copyright 2015 Steve Bhaerman. All rights reserved. If you’d like to wake up laughing, why not enroll in the Wake Up Laughing class? Swami Beyondananda is a noted social uncommontator and spiritual political pundit (If anyone punned it, Swami punned it first) and is the alter ego and brainchild of author and humorist Steve Bhaerman. Steve and Swami can be found at http://www.wakeuplaughing.com and on Twitter @swamibe. Drought-stricken California, which just had its driest January ever recorded, smashed another dismal record last month: the hottest February. This will be the 5th year in a row of historic drought in California, breaking a 120 year old record. California is the largest populated state in the country. One out of eight Americans reside in sunny, warming, no rain, CA. Our economy is recognized as the 8th largest in the world with Central Valley farmers producing some 42% of the nations food supplies for decades. For the second year in a row the Federal Water Agency, which controls CA mountain snowpack runoff, announced that zero water would be allocated to the 3300 state water agencies that it has supplied water to from the Sierra Nevada Mountain ranges for the past 54 years. Until recently the states “ice chest” had accounted for 44% of the state’s annual water budget. Last year, many Central Valley farmers had to fallow their fields when their water allotments were cut to 5% of normal, by Fed and State water agencies. The only exceptions being for those with grandfathered water rights, who can take as much as they like and are making millions and millions selling to those without these exclusive water right privileges. The ski industry and supporting tourist business around Lake Tahoe is in chaos. Baseline snowpack and skier traffic are down some 75% of normal and the only thing frozen around Tahoe these days are real estate sales. Californians aren’t the only ones feeling the effects of our collective “new normal” of hotter weather and little precious rain. 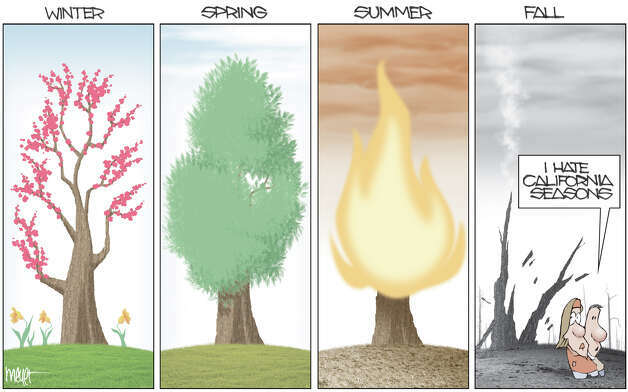 In Colorado they have been consistently shattering record warm temperatures by some 5-15 degrees. Eastern Colorado had record high temperatures of 82 degrees in early February. Alaska, again this year, is consistently recording warmer temperatures than Texas, up to some 20 degrees above normal so far this year. It has gotten so bad up in the once Great White North that this week the Iditarod dog sled race had to move 225 miles north. Snowfall in Anchorage was one-quarter of normal for the year. In the forests of Mendocino County where I live we are seeing trees literally exploding from the inside out. Once majestic beautiful Tan, California and Scrub Oak trees have succumbed to increased pest manifestation and infestation due to lack of water root moisture and are just toppling over everywhere. Strangely, our government officials are silent as to calling for an all-out effort by all to preserve and conserve what water we have in this major crisis. Golf courses are still being watered with only voluntary cut backs “requested”. Non-reclaimed water car washes, some facilities using 100 or more gallons of water per car, are still going strong. Energy frackers are still being satisfied with hundreds of thousands of gallons of potable drinking water per well site. Building permits are still being issued for new wineries in Sonoma and Napa Counties. New housing and other constructions projects the same. North Bay wine sales hit records again this year. Manicured lawns in the bedroom communities of Marin have never looked better. Restaurants are still pouring water to patrons without request. Business as usual. Business must grow. Nasdaq just went over the 5,000 mark, an all- time record high. The banksters are very fat, wealthy and happy while Central Valley farmers are readying to fallow more Ag land and try to figure out how they can stay in business again this year. Yet behind the scenes, in the dark recesses of California State governance, there is much scheming, plotting and long-term planning going on for the protracted, decades and decades long predicted water shortages ahead for us all. “Con + spirare, from the Latin. To breathe together. Those are the roots of conspiracy. Breathing together doesn’t sound like an activity of the ideologically deracinated whispering seditiously in a dank cellar or a board room, foul breaths denting a weak flame flickering over a candle nub, gunpowder or greed blackened fingers setting a timer, the whites of creased eyes glinting like knives with treason, murder, power, and deceit. Con + spirare sounds like healthy men and women standing in the sun figuring out how in the hell they are going to take care of each other and their aging mother Earth and love life while doing it. Breathing together, sharing the same air, plotting to make sure that what’s mine is yours, conspiring to save their self-respect, their ideals, the future for their children. Several years ago I gave a talk on Martha’s Vineyard about many of the people whose portraits I’ve painted in the Americans Who Tell the Truth series. I spent some time talking about the legacy of Martin Luther King, Jr. When I talk about King, I like to focus on his last year — the period when, defying the advice of many of his advisors in the civil rights movement, he spoke against the Vietnam War, equating racism with imperialism. King felt bound to make the point that the forces of capitalism, materialism, and militarism that were driving segregation were also driving the war, and until we confronted the source of the problem, the abuses would continue. It was April 4, 1967, in Riverside Church in New York, that he made that declaration. A year to the day before his assassination. It has always confounded me every year when we celebrate Dr. King’s life that no mention is made of that Riverside Church speech in the major media. We are always treated to sound bites of the 1963 I Have a Dream speech. That speech’s oratory is as powerful as it is non-confrontational. Which is why it is re-played for modern audiences. Dr. King was about confrontation. Non-violence and confrontation, each ennobling and making the other effective. In 1967 he said, “… my country is the greatest purveyor of violence in the world today.” And he explained how our economic system thrived on exploitation and violence, or, as Emma Goldman put it, “The greatest bulwark of capitalism is militarism.” This was probably the most important speech King ever gave and not playing it when we ostensibly honor him, is tantamount to castrating him morally and intellectually. Just as there is a long history of White America castrating black men, there is an equal legacy of Elite America cutting the most important truths of our social prophets out of the history books. We pay homage to King’s icon, the cardboard cutout, but not to his strongest beliefs and his most cogent analysis of our problems — to what vision called forth his courage. And, if we think that he spoke the truth, to censor that truth is to promote a curious kind of segregation. He is segregated, not for the color of his skin, but for the accuracy of his perception, how close to the bone his words cut. We can’t bear to hear the sound of truth’s knife scraping on hypocrisy’s bone. Only people who actually want to change the system dance to that music or want it to be heard. Equally important, and part of the same neglect, is the intentional ignoring of the facts of his death. In my talk on Martha’s Vineyard I spoke about William Pepper’s book, An Act of State: The Execution of Martin Luther King, Jr. Pepper had been James Earl Ray’s lawyer. Ray was the man convicted of killing King. But both Pepper and the King family were convinced that Ray was innocent. The King family hired Pepper to represent them in a suit; they asked only $100.00 in damages to clear Ray’s name. Before the trial came to court in 1999, Ray had died in prison. The jury determined that King had been assassinated by a conspiracy involving the Memphis police, the Mafia, the FBI, and the Special Forces of the U.S. Army. Ray, the patsy, had left town before the shot was fired. Pepper had confessions from people involved from each of the organizations named. The verdict was barely mentioned in the U.S. media then and is not mentioned every year on the anniversary of his death. Why? After my talk on Martha’s Vineyard a man came up to me and said, “I enjoyed your speech and was with you until you started that conspiracy stuff about MLK, Jr.” I said, “That’s not conspiracy. What I told you are facts.” End of conversation. I think we’re confronted with two conspiracies here: one to commit the crime, the other to ignore it even when the facts are known. ( Two sides of the same coin.) The man who accused me of slipping into the neurotic, aliens-are-among-us land of conspiracy nuts was unable to hear the evidence, perhaps because he was so utterly convinced by our government and media that conspiracies don’t exist, people who espouse them are dangerous fruitcakes, and if you begin to think like that, your whole house of cards wobbles then topples. Who wants that? Better a standing tower of marked cards, than having to admit the game is rigged and the ground is shaking. America is steeped in conspiracy, and even more steeped in propaganda that discredits those who try to expose the conspiracies. Whether we’re talking about MLK, Jr., JFK, RFK, Iran-Contra, 9/11, or, most importantly, the status quo, anyone who works to uncover the truth is branded a “conspiracy nut” and discredited before any evidence has a fair hearing. The government/corporate/media version is THE VERSION. Anything else is illusory. In fact, the cultural success of labeling investigative reporters and forensic historians, and, simply, anyone who tries to name reality, “conspiracy nuts” is perhaps the most successful conspiracy of our time. Well, not the most successful. That prize goes to the conspiracy to give corporations all the rights of individual persons under our Constitution. That conspiracy has codified and consolidated corporate power so that it controls our lives in almost every meaningful way. It controls the election funds of our candidates, and them once they are in office. It controls our major media including public broadcasting. It controls the content of our television programming. It controls how are tax dollars are spent making sure that the richest get the most welfare. It controls the laws, the courts, the prison system and the mind numbing propaganda that we are the greatest democracy on earth. It controls the values with which we raise our children. It controls our ability to dispense justice. It controls how we treat nature, how we deface our land with strip malls, and blow the tops off our mountains — a form of corporate free speech. It dictates our modes of transportation. It controls our inability to respond to true crises like climate change. It attempts to create a spiritual deficiency in every person that can be filled and healed only with stuff — and no stuff is ever enough. It is obvious to say that we have been engineered into a culture that values competitive consumption and consumers instead of community cooperation and citizenship. Capitalism with its obsessive and necessary appetite for consumption, expanding markets, resource depletion, and increasing profits has consumed democracy. Have you ever watched a small snake swallow a large frog? The snake’s hinged jaw stretches wider and wider, squeezing the frog millimeter by millimeter into its gullet until finally the snake looks like the Holland Tunnel might if it had devoured the Titanic. Then the acids and enzymes do their corrosive work. The frog becomes the snake. And the snake claims it is the frog. Capitalism has gulped down democracy and claimed it is democracy. When, immediately after 9/11, President Bush advised Americans to demonstrate their love of freedom and their resistance to terrorism by courageously, selflessly, hurrying to the mall to buy something, he was speaking as the snake that identifies itself as a frog. He was asking us to play a little game with our brains’ synapses, replace the snake icon with the frog’s. Sadly, he may also have been speaking about democracy in the only way that he can understand or recognize it. And, for him, Christianity has been another tidy meal for the snake. Perhaps this switcheroo is nowhere more obvious than in the military /industrial complex. We are told that the vulnerable frog needs protecting. The threats are grave. So we fork over our money and children’s lives for war and weapons. We are told that we are building security and peace. More lives. More weapons. What we aren’t told is that the largest US export to the world is weapons. What we aren’t told is that enormous fortunes are being made from the arms trade. What we aren’t told is that the more precarious and unstable the world is, the better the business for the arms dealers — that the real promotion is not for security and peace but insecurity and war, that the lives of our children are the necessary collateral damage for this monster. What we aren’t told is that the only real security is in cooperation, conservation, and fairness, not imperialism. The frog, who is a snake, wrapped in a flag, pleads for patriotism and counts the cash. The snake’s forked tongue is a barbeque fork on which we’ve all been roasted. The neocons have claimed, with some accuracy, that they can create reality faster than we can react: the deed is done, now deal with it. The troops have invaded, Halliburton, Blackwater, and Lockheed signed their contracts, the prisoners are tortured, your email is bugged, the resources for social programs are gone, the laws are changed, the Wal-Mart is built, the sludge dump has already polluted the aquifer, truth is hollowed out —- catch me if you can! How is that not conspiracy? The cooks & the crooks create a new status quo, legalize it, propagandize it, mythologize it, fundamentalize it, slather it with fear and patriotism, and force feed it to the complacent, sedated cow we call America. How is that not conspiracy? The reason we can’t talk about conspiracy is because it is the modus operandi. It isn’t the elephant in the room, it is the room itself. We all live there. We can impeach a few elephants, and we should, but the architecture is in place. And they control it. When I was in school, I was reminded – repeatedly — to avoid using an indefinite pronoun without identifying whom it refers to, as in, “They are coming to get us,” … or, “They control everything.” Who are They? It’s bad practice to think and write like that. Without reference it just sounds like paranoia. But the hell of it is that it’s damned hard to say who the They are that are in conspiracy to destroy democracy and, by exploitation, nature. Did They do it on purpose or merely discover by serendipity, like cavemen seeing copper ooze out of a rock by a fire, the wondrous possibility and power of what they had found. For instance, the invention of the TV was not a conspiracy. But once the realization of how TV could be used to submerge the public in a lobotomizing swamp of advertising, sound bites, inactivity, community destruction, titillation, false history, empty myth, consumption, and complicity in making fortunes for the sponsors, the program was clear. Conspiracy was the silent partner in the euphemism good business practice. And, once they saw the implications of giving corporations First Amendment rights, they were home free. We need to embrace conspiracy in two ways. One, admit that it’s real, its quotidian, it’s the fabric of our lives, the mercury in the air, the dioxin in the water, it’s filling the airwaves and the marketplace and the courts and the halls of Congress before we even get out of bed every morning. Two, counter it with a conspiracy of our own. On our side we have the fundamental fact that although the corporate They can alter many of our realities, they can’t alter Reality. They can’t change the behavior of Nature. They can sell off the rain forest, but they can’t leverage the effect of cutting it. They can keep the mileage of cars poor so we’ll buy more gas, but they can’t alter the amount of oil in the ground or the damage to the atmosphere. They can privatize every human interaction and every natural resource, but they can’t privatize the laws of nature. They have conspired to change reality. We must conspire to live in harmony with Reality. In the same way, they can conspire to kill Martin Luther King, Jr., but they can’t totally eradicate the truth of who did it and why. Con + spirare, from the Latin. To breathe together. Those are the roots of conspiracy. Breathing together doesn’t sound like an activity of the ideologically deracinated whispering seditiously in a dank cellar or a board room, foul breaths denting a weak flame flickering over a candle nub, gunpowder or greed blackened fingers setting a timer, the whites of creased eyes glinting like knives with treason, murder, power, and deceit. Con + spirare sounds like healthy men and women standing in the sun figuring out how in the hell they are going to take care of each other and their aging mother Earth and love life while doing it. Breathing together, sharing the same air, plotting to make sure that what’s mine is yours, conspiring to save their self-respect, their ideals, the future for their children. A conspiracy to make the common good and the love of nature the common denominator of every economic transaction. And the simple truth is either we start breathing together, conspiring big time, right out in the open, nakedly, unashamedly, or we will have conspired in secret, by default, in our own demise. We have let them breathe for us, and they have stolen our breath, our air, our spirit. Secret con + spirare is death. Open con + spirare is life. Conspiracy is dead. Long live conspiracy!